Star Wars Week: Star Wars + Tom Tom = Giveaway! The Tom Tom VIA 1535TM is a great companion for your trips around the galaxy. I’ve never really used a GPS before so this made for an interesting experience. The device itself is pretty simple and I appreciated the ease of getting my device ready for the road. Of all the really neat features that it has, I found a few especially helpful. One of my biggest pet peeves about following directions is not knowing which lane to get in for the next turn. To help make sure I don’t miss my exit, the advanced lane guidance feature came in handy. The voice guidance is clear and easy to understand. Another neat little feature I discovered while on my way to work one day was the IQ routes. I started to notice my suggested route would change based on the time of day I was driving. Since traffic patterns are different at 7am than they are at 5pm, it was a nice feature that helped me get home just a little bit quicker. One of the neat, but kind of funny features is the voice command feature. While testing this out, I was in the passenger seat and asked it to take me to Jo-Ann Fabrics. It must not have heard me correctly because it replied “Did you say Jack in the Box?” Needless to say, my husband about rolled over laughing. I’ve never had a voice command feature (not even Siri) that got everything I said right. Even if you don’t need the GPS to get you to the grocery store, the voice command feature might give your passengers some good laughs on the way. Of all the features of device, my favorite is the ability to customize the device with various Star Wars voices, sounds and images. So far, my personal favorite customization is C-3PO’s voice guidance. His personality fits that of a side seat driver you want to slap (much like the real character). Now on to the real fun stuff…giveaway time! In honor of our week-long celebration of the force, Tom Tom has given us a Tom Tom VIA 1535TM device along with a Star Wars voice download! All you need to do to enter is leave a comment captioning this photo by 11:59pm, Eastern Standard Time on May 8th. Winners will be chosen randomly and announced on May 9th. ← Star Wars Week: Surf’s Up, 501st Florida Garrison! 40 Responses to Star Wars Week: Star Wars + Tom Tom = Giveaway! I’m just a simple man, trying to make my way in the galaxy. Damn, I knew I should have taken that left turn at Alderaan! Where is the “Jo-Ann Fabrics” that I am looking for? What do you mean no place named Alderan? It was there a minute ago! I’m just a simple man, trying to make my way in traffic. Take a left at Jabba’s palace, then a right at the Lars homestead. Then proceed 20 parsecs pass the Sarlaac pit. You have now arrived at your destination. Is this a tracking device I found stuck to my car? Hey, wait a minute! That’s not my voice on this thing, it’s one of my clones!! What do you mean, “You can’t get there from here”? Surely this thing isn’t limited to terrestrial directions? Real Bounty Hunters use a Tom Tom. It’s impossible to get around Coruscant without this device. This is not the route you are looking for. Hmmmmm…. No day care in this system. I guess Boba can just tag along with me to Geonosis. No harm in that. New ride, and a new Tom Tom device! Now if I can only find Aayla Secura’s voice to download…. I feel like I’m going to lose my head! Stupid touch screens – need to get some upgraded gloves! Always a pleasure to meet a … wait, why are you taking me to the Jedi Temple!? In one parsec, turn left at Alderaan. No, that was the route I was looking for. Recalculating. 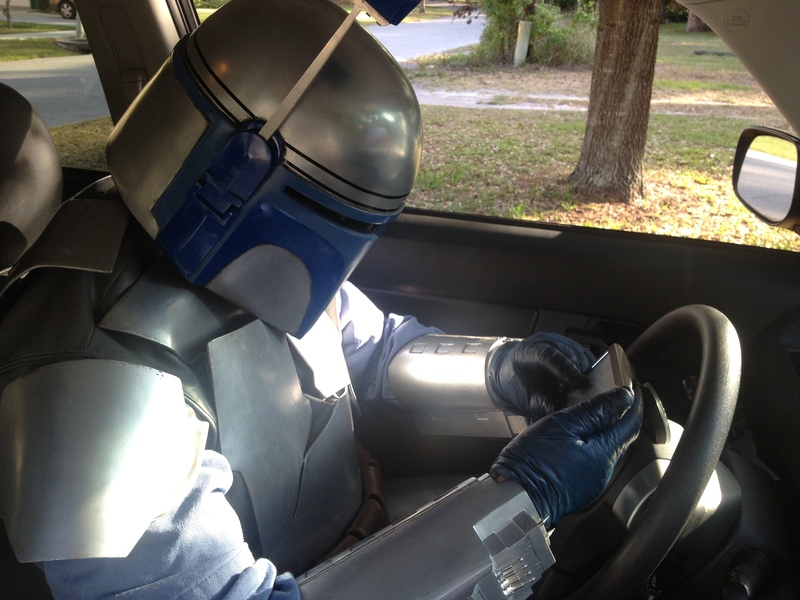 When times were tough, Jango hired out to birthday parties….